1. In small saucepot, heat berries, 1/4 cup sugar, water and 1 pinch salt to simmering over medium-high heat; cook 6 to 8 minutes, stirring occasionally or until slightly thickened. Stir in lemon juice and zest; cool. Refrigerate at least 2 hours before serving. Makes about 1 cup. 2.In medium bowl, whisk together half and half and egg yolks. In medium saucepot, whisk cornstarch and remaining 1/2 cup sugar and 1/8 teaspoon salt; gradually whisk in milk. Heat to boiling over medium-high heat, whisking constantly; boil 1 minute, whisking constantly. To temper egg mixture, transfer half the hot milk mixture into egg mixture while whisking constantly, then add egg-milk mixture back to saucepot. Boil 1 minute, whisking constantly. Remove from heat; whisk in butter and vanilla extract. 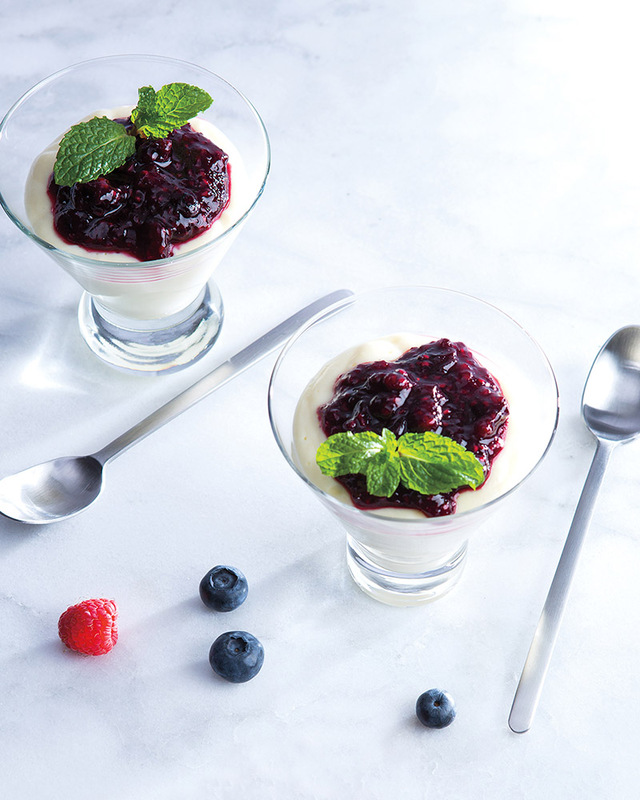 3.Transfer pudding to 6 dessert bowls or glasses; refrigerate at least 2 hours before serving. Serve topped with berry mixture. > Looking for the perfect hostess gift for the holidays? Try making homemade vanilla extract! Everyone bakes during the holiday season so you know it will be a gift put to good use. All you need is vanilla beans, vodka and glass storage jars. Pick up fresh vanilla beans from your local Martin’s produce department. Split the vanilla beans lengthwise. Add 2 vanilla beans and 1 cup vodka to a glass jar of choice. Place lid on jar. Allow extract to sit in a cool dark place for 2+ months, shaking occasionally. Decorate your glass jar with a festive holiday ribbon.